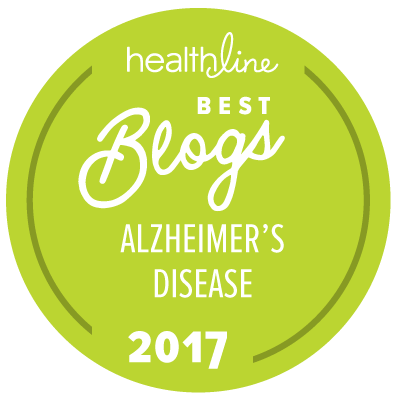 Today’s blog is specifically geared for those who might be developing dementia symptoms. 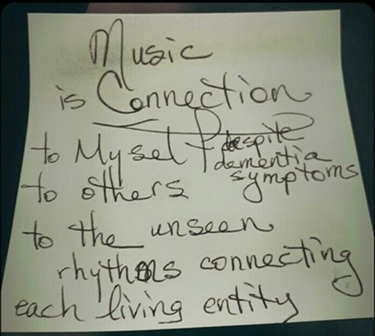 Like my friend George Huba PhD suggested at http://hubaisms.com/2015/08/05/some-things-you-might-do-before-you-have-cognitivedecline-mindmap/ , this is the time to address some preliminaries, one of which is documentation of music preference. Due to jumble of audio reception in my brain, I am no longer able to enjoy many of the songs from youth and earlier adulthood. Multiple instruments or fast beat usually feels too “busy” and chaotic, even with the familiar songs that I enjoyed during earlier years. If there is absolutely no other action or sound going on in the house then I can listen to one or two songs that are “busy” but more than one or two songs is a problem. Both for my communication with self and with others, I think it important to document not only style but particular songs that are part of what it means to be ME … and why. Maybe my list will give YOU some ideas of a list for yourself (or loved one). You will certainly know ME much more intimately after you read the list. Dad always worked at least two jobs while we were growing up, and one was always as a railroad “switchman”. He had a wonderful version of Wabash Canon Ball that he perfected on harmonica. 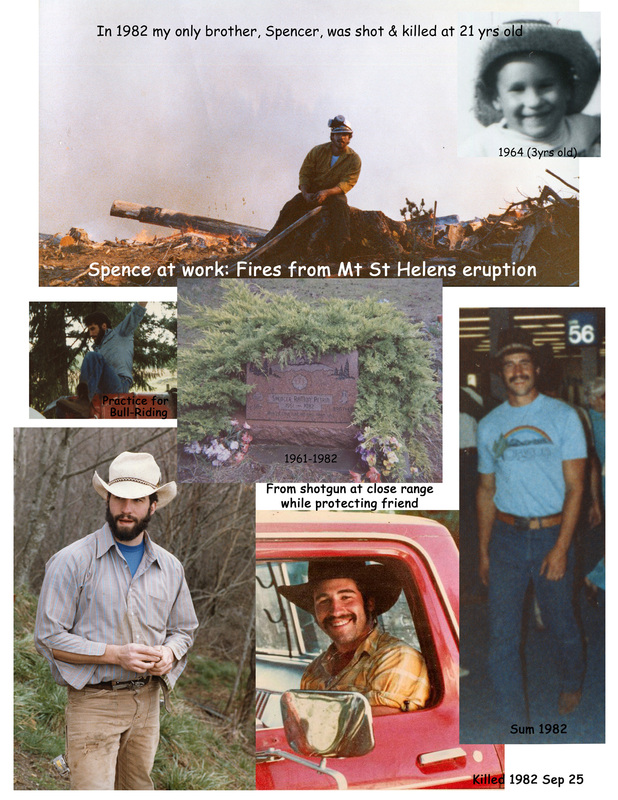 We all sat on the floor around the fire while Dad’s harmonica imitated the sound of the engine starting, picking up speed, the song, then brakes, and release of air. It was an auditory experience. “Malaguena“ (Larry Adler) has always been my personal favorite of the songs Dad played on his harmonica with the wild driving tempo in crescendo, then achingly tender diminuendo. It was originally the sixth movement of Lecuona’s Suite Andalucía, and Dad played it magnificently. 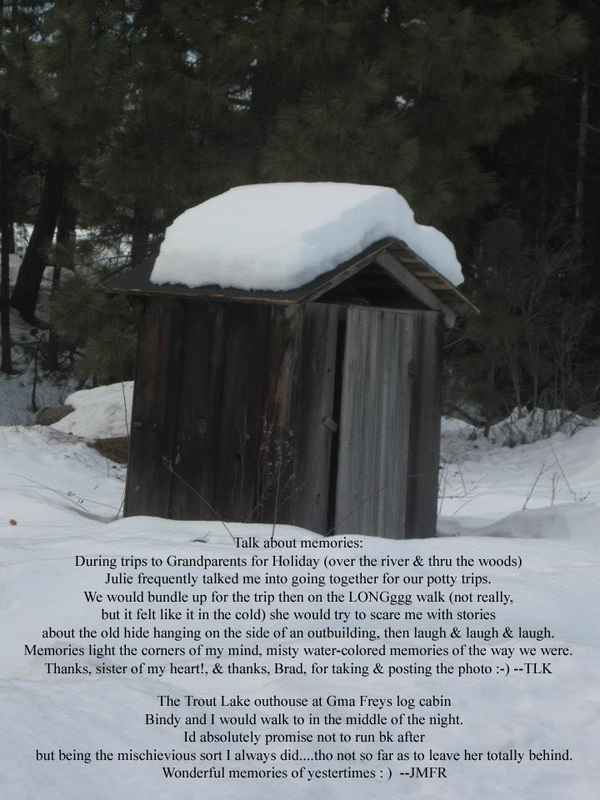 “Grandma’s Feather Bed“ (John Denver) reminds me of holidays at my grandparent’s rural log cabin home, and four cousins sleeping head-to-toe (two at each end) in the single bed, with Grammy’s feather bed under us and comforters stacked over us … in between trips thru the snow to the outhouse. “Wayward Wind“ (Frankie Lane) for my paternal grandmother, who spent summers at the lake in Minnesota (where my father was born and spent his early years at the Chippewa Reservation) and spent each winter near us in Oregon. “The Chippewa Song“ was handed down from my father. One year I sang it to a music specialist at the Reservation who acknowledged the Chippewa language and culture in the song, but said “like many of the old songs, that song must be lost to history”. I only remember the first of many verses, and it was sung to my children at bedtime … just as my father sang it to me. The Irish and cowboy heritage from maternal side of my family is memorialized with my maternal grandmother’s favorite song “Oh Danny Boy“, and “The Master’s Call” (by Marty Robbins) which became my son’s special bedtime song. “Michelle“ (by The Beatles) was primary song for both my sister and my daughter, which I sang her at each bedtime during her childhood. My brother, sister and I regularly sang “They Call the Wind Maria“ (Harve Presnell) with Dad on harmonica. Another family favorite was “Impossible Dream“, which was a favorite of my brother in his early youth. During seventh grade I learned the songs from many musicals, and ever since 1970, “Who Will Buy this wonderful morning” became my default song. That song is what I hum every morning until something else enters my mind or until I hear something that day. I was about 40 years old before one of the children pointed out that fact. Never really realized until then. 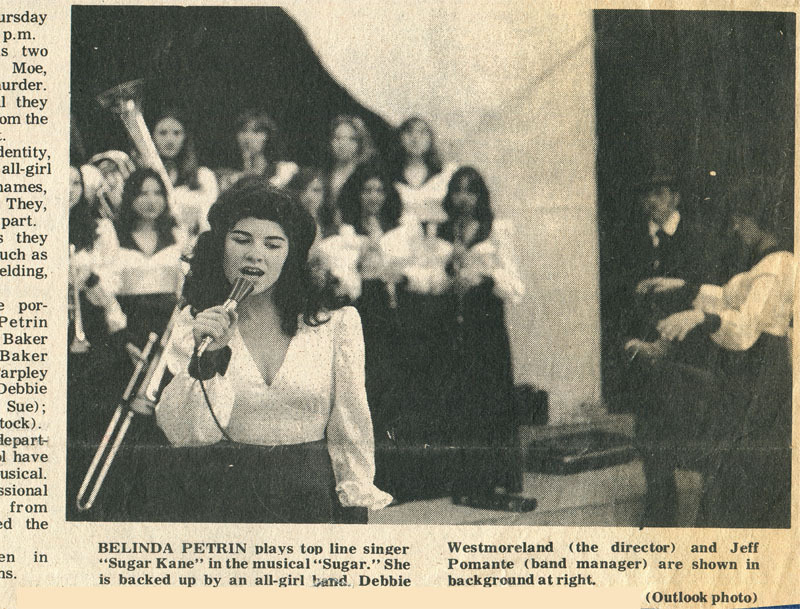 Our small High School had one drama production per year with joint participation from choir, art department, and much of the community. My Senior year we produced the musical “Sugar” (based on the Marilyn Monroe movie “Some Like it Hot”). As “Sugar”, I had the female lead. “Big Bad John“ (Jimmy Dean) was my song for the best friend I had thru many bad years; John Kimbley. He was the boy across the street whom I babysat during High School years, and was best friends with my brother. He was even more strongly integrated into our family after my brother was killed. Years later he returned from his military time, and I returned home from military base in Italy, in order to care for Dad while he was dying of cancer, so we both were living in the same houses, across the street, as adults. We shared coffee every morning and I had extremely vivid dream of John’s death at 25 years old. Several months later he died almost exactly as I had dreamed, and I had a really REALLY hard time with that one! (written autobiography page, but not online yet). 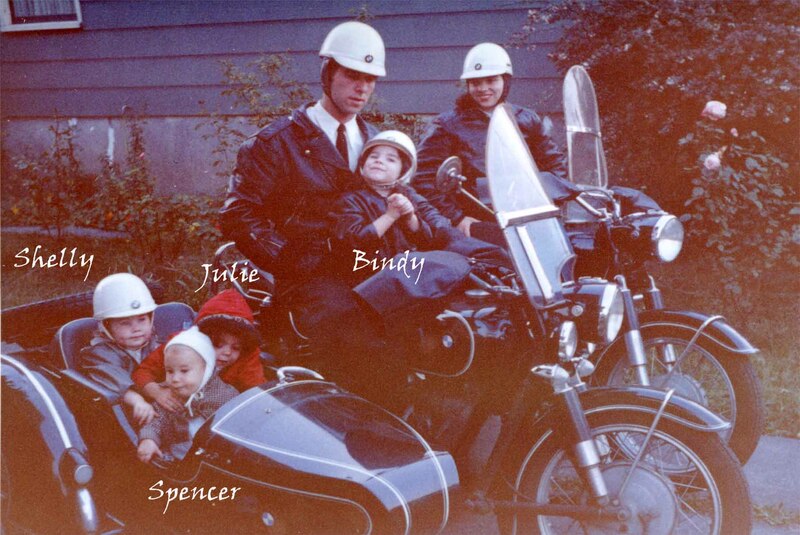 It was as if I had suddenly lost Julie again, lost my brother Spence, and lost John … all at one time. I sang “The Rose” to my new husband … during the wedding ceremony, to go with the vows we wrote. (Again, autobiography page not online yet). “You Gave me a Mountain“ (by Marty Robbins recorded by Frankie Lane) is for the many many strong challenges of my life. 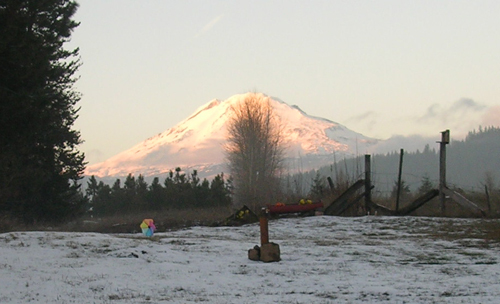 Also, of course the large impact Mount Adams and the little rural town of Trout Lake have played in my family history and in my own life. 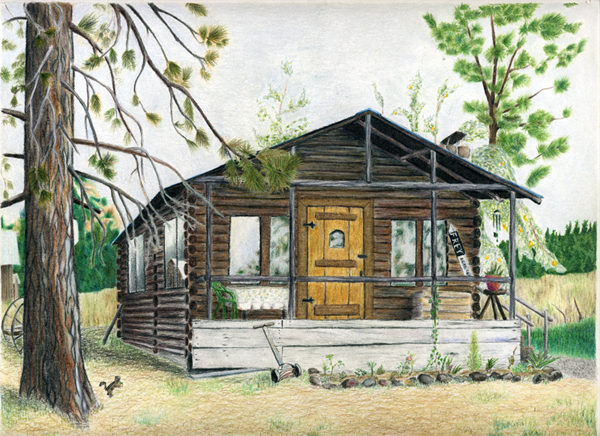 The log cabin which my grandfather “helped” build (as a toddler) is the one PLACE on earth that is most deeply ingrained in my personhood … with Mt. Adams “in the backyard”. The location of belonging and Shalom (peaceful wholeness). “You are so Beautiful” (Joe Cocker) is my Divine love song. Don’t ask me why … because I am not going to share that story. And of course “The Taps” with which Dad always closed harmonica sessions before tapping his chromatic harmonica on his lap to clear it … and sending us to bed. “Try to Remember” (Harry Belafonte) and “The Way We Were“ (Barbra Streisand) represent my efforts to retain moments and memories, despite dementia symptoms. I am sure that I will add many more favorites to this playlist, but these songs represent most of who I was as a youngster, who I became as a young adult, and who I became as a mother. Some of these songs are saved in “Musical Memories” listing at my youtube channel https://www.youtube.com/playlist?list=PL2E2lPBsUeBiLgnJd9_diZPdHfDXdWKGy . How about YOURS; where is your list ?? !! * Admin issues: SHARE dementia awareness thru buttons below. Feel free to leave your thoughts in the form of comments, but please filter your comments with truthful loving kindness to all concerned. If interested in receiving notice of future blog postings, subscriptions are available through a “follow” button in the upper left corner (MS Explorer) or lower right (Safari, Mozilla Firefox and Chrome). If there is an advertisement below, I have no control over what is shown. Full legal name Truthful Loving Kindness copyright on 2015-08/25. 8 hours. This entry was posted in Arts n Crafts, Communication, Important, Journal and tagged art, communication, connection, dementia, music, songs. Bookmark the permalink. This is superb Tru! Thank you so much for sharing. I envy the heritage of music in your life and your ability to convey that special connection. This will help me to further refine my own archive of musical memories and connections. I am grateful! Tru, this sends a jolt to my mind. We have almost identical childhood. The songs, the waltz, right down to dancing with feet on dad’s. I missed the tango. The older kids grew up and left home. Dad was getting old. I did learn the cha-cha, rhumba and the polka. I am going to start my song list, thanks to you! Great post. I found it interesting that so many of your favorite songs also have direct connections for me — figures, we are about the same age. Your story about your dad reminded that my dad also played chromatic harmonica and could usually play something after hearing it only once or twice. He picked up the harmonica in WWII France and Germany. Since you like Streisand’s version of Avinu Malkeinu you might like Songs of Our Fathers, I&II by Andy Statman and David Grisham (two of the greatest mandolinists in the world and also bluegrass musicians). Andy Statman is also a virtuoso clarinetist in Klezmer. Of course I still love Street Fighting Man by the Stones. My story is that it was 1971 and I went to DC to demonstrate in the May Day anti-war 5-day blockade of the city through its bridges. Up near the George Washington University Campus and the windows in the dorm were wide open and Street Fighting Man was blasting out at probably the loudest volume possible on a circa 70s stereo. You know how I feel about music and stories and memories. I really enjoyed your stories.